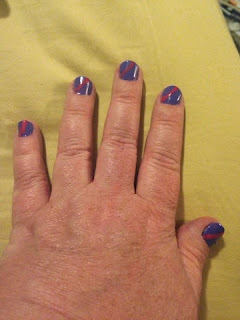 Well, as much as I try to do nail art, I just don't think I have a steady enough hand to make it happen. I guess this is as good it gets without getting them professionally done. I wanted some bright, Spring color--- I think I may have ended up with an 80s look instead. Why does this remind me of a mix between Miami Vice and Debbie Gibson?